(Bloomberg) -- Armed with waivers to keep importing Iranian oil without running afoul of U.S. sanctions, some of the Islamic Republic’s top customers are preparing to buy. 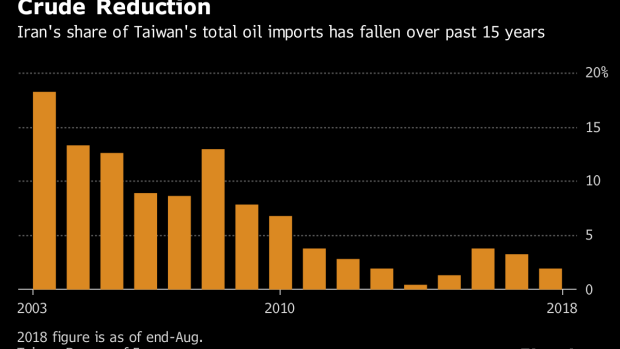 India, China and South Korea, three of Asia’s top four buyers, got waivers allowing them to purchase a combined 860,000 barrels a day. The levels for Japan, Italy and Greece are yet to be confirmed. Turkey got waivers for about 60,000 a day, far less than it bought in 2017. Turkey is more reliant on Iranian crude than any other country: almost half its imports came from the Persian Gulf country in the first half of this year, according to data compiled by Bloomberg. Turkish Energy Minister Fatih Donmez said Friday that the sanctions on Iran indirectly impact Turkish people. Tupras Turkiye Petrol Rafinerileri AS, by far the nation’s largest refiner, is already looking for alternatives, he said. --With assistance from Sarah Chen, Alfred Cang, Stephen Stapczynski, Samson Ellis, Yu-Huay Sun, Nick Wadhams, Tsuyoshi Inajima, Sharon Cho and Alaric Nightingale.